Transcultural Buddhism: Is Richard Dawkins a Buddhist? "Anyone who accepts these four seals, even independently of Buddha’s teachings, even never having heard the name Shakyamuni Buddha, can be considered to be on the same path as he." According to the fundamental tenets of Buddhism, all phenomena derive their existence from causes, structures and mental designation. They do not have any defining essence, or inherently existing nature that determines what they are from within themselves. Ultimately, their identity resides solely in the arbitrary judgement of the observer. "...We would all agree that a six-foot woman is tall, and a five-foot woman is not. Words like 'tall' and 'short' tempt us to force the world into qualitative classes, but this doesn't mean that the world really is discontinuously distributed. Were you to tell me that a woman is five feet nine inches tall, and ask me to decide whether she should therefore be called tall or not, I'd shrug and say 'She's five foot nine, doesn't that tell you what you need to know?' But the discontinuous mind, to caricature it a little, would go to court (probably at great expense) to decide whether the woman was tall or short. Indeed, I hardly need to say caricature. For years, South African courts have done a brisk trade adjudicating whether particular individuals of mixed parentage count as white, black or coloured. The discontinuous mind is ubiquitous. It is especially influential when it afflicts lawyers and the religious (not only are all judges lawyers; a high proportion of politicians are too, and all politicians have to woo the religious vote). Recently, after giving a public lecture, I was cross-examined by a lawyer in the audience. He brought the full weight of his legal acumen to bear on a nice point of evolution. If species A evolves into a later species B, he reasoned closely, there must come a point when a mother belongs to the old species A and her child belongs to the new species B. Members of different species cannot interbreed with one another. I put it to you, he went on, that a child could hardly be so different from its parents that it could not interbreed with their kind. So, he wound up triumphantly, isn't this a fatal flaw in the theory of evolution? But it is we that choose to divide animals up into discontinuous species. On the evolutionary view of life there must have been intermediates, even though, conveniently for our naming rituals, they are usually extinct: usually, but not always. The lawyer would be surprised and, I hope, intrigued by so-called 'ring species'. The best-known case is herring gull versus lesser black-backed gull. In Britain these are clearly distinct species, quite different in colour. Anybody can tell them apart. But if you follow the population of herring gulls westward round the North Pole to North America, then via Alaska across Siberia and back to Europe again, you will notice a curious fact. The 'herring gulls' gradually become less and less like herring gulls and more and more like lesser black-backed gulls until it turns out that our European lesser black-backed gulls actually are the other end of a ring that started out as herring gulls. At every stage around the ring, the birds are sufficiently similar to their neighbours to interbreed with them. Until, that is, the ends of the continuum are reached, in Europe. At this point the herring gull and the lesser black-backed gull never interbreed, although they are linked by a continuous series of interbreeding colleagues all the way round the world. The only thing that is special about ring species like these gulls is that the intermediates are still alive. All pairs of related species are potentially ring species. The intermediates must have lived once. It is just that in most cases they are now dead. ...The word 'apes' usually means chimpanzees, gorillas, orang-utans, gibbons and siamangs. We admit that we are like apes, but we seldom realise that we are apes. 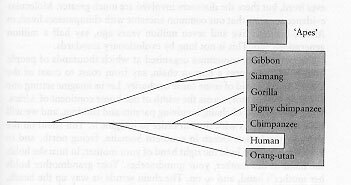 Our common ancestor with the chimpanzees and gorillas is much more recent than their common ancestor with the Asian apes — the gibbons and orang-utans. There is no natural category that includes chimpanzees, gorillas and orang-utans but excludes humans. The artificiality of the category 'apes', as conventionally taken to exclude humans, is demonstrated by Figure 7.1. This family tree shows humans to be in the thick of the ape cluster; the artificiality of the conventional category 'ape' is shown by the stippling. In truth, not only are we apes, we are African apes. The category 'African apes', if you don't arbitrarily exclude humans, is a natural one. The stippled area in Figure 7.2 doesn't have any artificial 'bites' taken out of it. 'Great apes', too, is a natural category only so long as it includes humans. We are great apes. All the great apes that have ever lived including ourselves, are linked to one another by an unbroken chain of parent-child bonds. The same is true of all animals and plants that have ever lived, but there the distances involved are much greater. Molecular evidence suggests that our common ancestor with chimpanzees lived, in Africa, between five and seven million years ago, say half a million generations ago. This is not long by evolutionary standards. Happenings are sometimes organised at which thousands of people hold hands and form a human chain, say from coast to coast of the United States, in aid of some cause or charity. Let us imagine setting one up along the equator, across the width of our home continent of Africa. It is a special kind of chain, involving parents and children, and we will have to play tricks with time in order to imagine it. You stand on the shore of the Indian Ocean in southern Somalia, facing north, and in your left hand you hold the right hand of your mother. In turn she holds the hand of her mother, your grandmother. Your grandmother holds her mother's hand, and so on. The chain wends its way up the beach, into the arid scrubland and westwards on towards the Kenya border. How far do we have to go until we reach our common ancestor with the chimpanzees? It is a surprisingly short way. Allowing one yard per person, we arrive at the ancestor we share with chimpanzees in under 300 miles. We have hardly started to cross the continent; we are still not half way to the Great Rift Valley. The ancestor is standing well to the east of Mount Kenya, and holding in her hand an entire chain of her lineal descendants, culminating in you standing on the Somali beach. The daughter that she is holding in her right hand is the one from whom we are descended. Now the arch-ancestress turns eastward to face the coast, and with her left hand grasps her other daughter, the one from whom the chimpanzees are descended (or son, of course, but let's stick to females for convenience). The two sisters are facing one another, and each holding their mother by the hand. Now the second daughter, the chimpanzee ancestress, holds her daughter's hand, and a new chain is formed, proceeding back towards the coast. First cousin faces first cousin, second cousin faces second cousin, and so on. By the time the folded-back chain has reached the coast again, it consists of modern chimpanzees. You are face to face with your chimpanzee cousin, and you are joined to her by an unbroken chain of mothers holding hands with daughters. 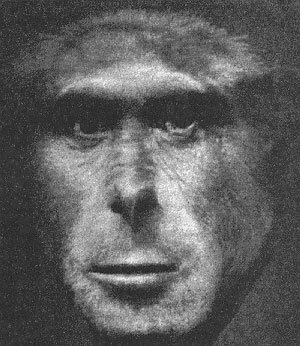 If you walked up the line like an inspecting general -past Homo erectus, Homo habilis, perhaps Australopithecus afarensis -and down again the other side (the intermediates on the chimpanzee side are unnamed because, as it happens, no fossils have been found), you would nowhere find any sharp discontinuity. Daughters would resemble mothers just as much (or as little) as they always do. Mothers would love daughters, and feel affinity with them, just as they always And this hand-in-hand continuum, joining us seamlessly to chimpanzees, is so short that it barely makes it past the hinterland of Africa, the mother continent. It is sheer luck that this handful of intermediates no longer exists. ('Luck' from some points of view: for myself, I should love to meet them.) But for this chance, our laws and our morals would be very different. We need only discover a single survivor, say a relict Australopithecus in the Budongo Forest, and our precious system of norms and ethics would come crashing about our ears. The boundaries with which we segregate our world would be all shot to pieces. Racism would blur with speciesism in obdurate and vicious confusion. Apartheid, for those that believe in it, would assume a new and perhaps a more urgent import. But why, a moral philosopher might ask, should this matter to us? Isn't it only the discontinuous mind that wants to erect barriers anyway? So what if, in the continuum of all apes that have lived in Africa, the survivors happen to leave a convenient gap between Homo and Pan? Surely we should, in any case, not base our treatment of animals on whether or not we can interbreed with them. If we want to justify double standards - if society agrees that people should be treated better than, say, cows (cows may be cooked and eaten, people may not) - there must be better reasons than cousinship. Humans may be taxonomically distant from cows, but isn't it more important that we are brainier? Or better, following Jeremy Bentham, that humans can suffer more - that cows, even if they hate pain as much as humans do (and why on earth should we suppose otherwise? ), do not know what is coming to them? Suppose that the octopus lineage had happened to evolve brains and feelings to rival ours; they easily might have done. The mere possibility shows the incidental nature of cousinship. So, the moral philosopher asks, why emphasise the human/chimp continuity? Yes, in an ideal world we probably should come up with a better reason than cousinship for, say, preferring carnivory to cannibalism. But the melancholy fact is that, at present, society's moral attitudes rest almost entirely on the discontinuous, speciesist imperative. This arresting picture is hypothetical. But I can assert, without fear of contradiction, that if somebody succeeded in breeding a chimpanzee/ human hybrid the news would be earth-shattering. Bishops would bleat, lawyers would gloat in anticipation, conservative politicians would thunder, socialists wouldn't know where to put their barricades. The scientist that achieved the feat would be drummed out of politically correct common-rooms; denounced in pulpit and gutter press; condemned, perhaps, by an Ayatollah's fatwah. Politics would never be the same again, nor would theology, sociology, psychology or most branches of philosophy. The world that would be so shaken, by such an incidental event as a hybridisation, is a speciesist world indeed, dominated by the discontinuous mind. I have argued that the discontinuous gap between humans and ‘apes’ that we erect in our minds is regrettable. I have also argued that, in any case, the present position of the hallowed gap is arbitrary, the result of evolutionary accident. If the contingencies of survival and extinction had been different, the gap would be in a different place. Ethical principles that are based upon accidental caprice should not be respected as if cast in stone. Nevertheless, it must be conceded that this book's proposal to admit great apes to the charmed circle of human privilege stands square in the discontinuous tradition. Albeit the gap has moved, the fundamental question is still 'Which side of the gap?' Regrettable as this is, as long as our social mores are governed by discontinuously minded lawyers and theologians, it is premature to advocate a quantitative, continuously distributed morality. Accordingly, I support the proposal for which this book stands." 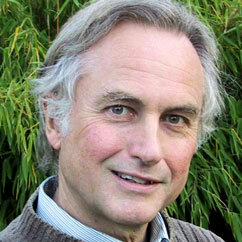 So is Richard Dawkins a Buddhist? - makes one a (minimalist) Buddhist. Dawkins shows an excellent understanding of Lack of Inherent existence in the essay quoted, and as a Darwinist he is obviously well aware of the related seal of Impermance. "The total amount of suffering per year in the natural world is beyond all decent contemplation. During the minute that it takes me to compose this sentence, thousands of animals are being eaten alive, many others are running for their lives, whimpering with fear, others are slowly being devoured from within by rasping parasites, thousands of all kinds are dying of starvation, thirst, and disease. It must be so. If there ever is a time of plenty, this very fact will automatically lead to an increase in the population until the natural state of starvation and misery is restored." ''We have the power to defy the selfish genes of our birth and, if necessary, the selfish memes of our indoctrination. We can even discuss ways of deliberately cultivating and nurturing pure, disinterested altruism - something that has no place in nature, something that has never existed before in the whole history of the world. We are built as gene machines and cultured as meme machines, but we have the power to turn against our creators. We, alone on earth, can rebel against the tyranny of the selfish replicators." See further discussion at Accepting our Evolutionary History does not Mean Rejecting our Spirituality . ...with the mind being reducible to the operations of causality on structure in the same way that the activities of a computer are reducible to the operation of algorithms on datastructures. To the Buddhist, in contrast, the mind is an irreducible foundation of reality. See All Watched over by Machines of Loving Grace - The Monkey in the Machine and the Machine in the Monkey for a detailed discussion of this topic. Although Richard Dawkins is not quite a Buddhist, his philosophy, derived by completely independent reasoning and within a non-Buddhist culture and intellectual environment, comes very close indeed to the four fundamental tenets of Buddhism. "Dawkins is doing religion a favour – by exposing faith and spirituality to criticism, he paves the way for their renewal. Claims to special privilege in society, indoctrination of belief as fact, repressive or violent acts as a means of evangelism, and the upholding of outdated worldviews on scriptural grounds – all these and many other examples of the misuse of spiritual traditions do them no favours and should be dropped. If that is pick 'n' mix religion, can I be first in the queue at the sweet counter?" "Why does Professor Dawkins claim Hinduism and Buddhism offer much more sophisticated world-views? I believe it is due to the fundamental differences that are found when comparing Western religions with those of Asia. The Abrahamic religions (Judaism, Christianity and Islam) model the cosmos on the politics of the ancient Middle East. God is viewed as a monarch who rules and controls everything. Just as a tyrant king of this period, God is able to severely punish or reward his subjects as he sees fit. The Dharmic religions (Buddhism, Zen, Taoism and Hinduism) don't see the cosmos as something that is responding to a ruler or controller. They believe the Universe is a self perpetuating unity. The Western faiths also repel and distance themselves from Nature. Whereas the Asian philosophies are firmly rooted in the natural world and see all of Nature as divine. Unquestioning faith is paramount in the Abrahamic religions and everything else is seen as secondary to the holy dogma. Yet in the Asian religions the very opposite is true. Acts of compassion are always foremost and adherents are free to believe whatever they choose. Buddha is quoted as saying "Do not believe anything unless it agrees with your own experiences and common sense; even if it is said to have come from me." Although Richard Dawkins may be unlikely to go for refuge to the Three Jewels anytime soon, his worldview shows a strong 'convergent evolution' towards Buddhist philosophy. The major difference would seem to be the nature of the mind. In Buddhist philosophy the mind is not reducible to physical causality and structure, but is a fundamental foundation of reality. Since he hasn't, to my knowledge, stated otherwise, I would guess that Richard Dawkins holds the scientifically orthodox physicalist/computationalist point of view. A very good article,which relates science to Buddhism on scientific and material/physical grounds and the similarity of the two;Mentioned of nature of the mind is the difference of the two, is the most interesting and mind challenging(ultra-physical or back to emptiness of exchangeable/convertible between material and mind in the mind of the holder ).Big thanks for sharing. A possible example of irony, unless the writer accepts his discontinuous mind.